For months, it has been rumored that Kanye West has been buddying up with Vogue Editor in Chief, Anna Wintour, in a campaign to get his girl/fiancee/baby mama, Kim Kardashian, on the cover. Well now both of their dreams have come true. The “#WorldsMostTalkedAboutCouple” (not Jay-Z and Beyonce?) 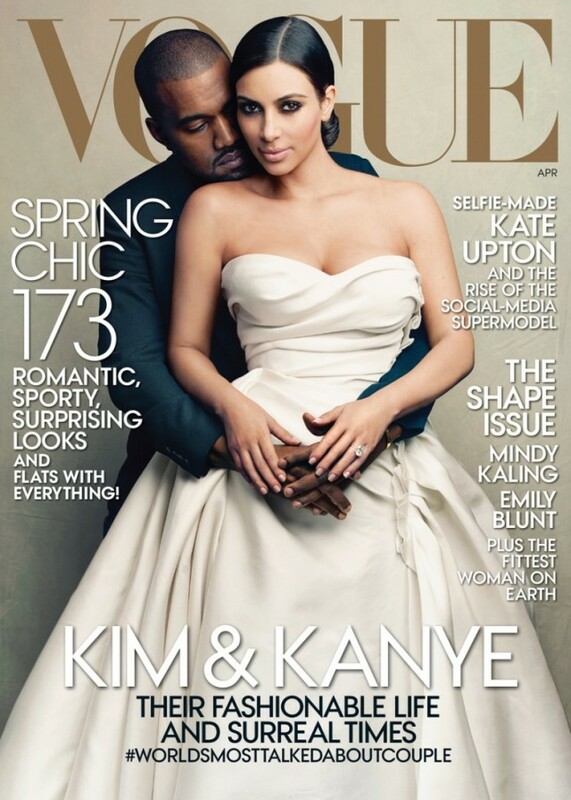 are on the cover of Vogue’s April 2014 issue; Kim in a Lanvin wedding gown and Kanye in a suit. the editorial was shot by famed photog Annie Leibovitz. And in a behind-the-scenes video, we see them posing on the open road, against his black Lamborghini Aventador, on a private jet, and with baby North West, while she dons various designer gowns and he wears his usual designer duds. I have to admit, they look like one beautiful, happy family. What do you think of Kim and Kanye on the cover of Vogue Magazine? Awesome magazine.I like it.Thanks you to share it.